The fight for Florida continues. 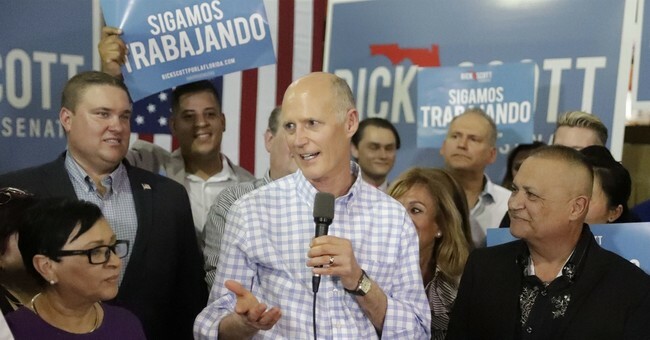 A Broward Circuit Court judge has denied Florida governor and Republican U.S. Senate candidate Rick Scott‘s injunction request, which asked for the judge to “impound and secure” voting machines and ballots at the Broward Election office as the winds of recount controversy swirl. Judge Jack Tuter notably shut down that request because he hasn’t seen evidence that would require him to grant it. Nonetheless, Tuter said, the public’s confidence in the vote counting process is of paramount importance. The judge even suggested sending three more armed Broward County Sheriff’s deputies to election headquarters as supervisors. “There needs to be an additional layer of confidence,” Tuter said. According to CBS Miami, Tuter suggested that the county send two deputies to the election office to watch cameras and USB drives, and a third deputy to monitor the other deputies.